Being Frugal and Making It Work: The Perfect Gift for Everyone: Personalized Creations! The Perfect Gift for Everyone: Personalized Creations! Personalized gifts make the perfect gift for the holidays and special occasions throughout the year. From Christmas and birthdays to weddings, anniversaries and graduations... giving a personalized gift shows that you care enough to go that extra step. It shows that you are giving a gift that comes from the heart! 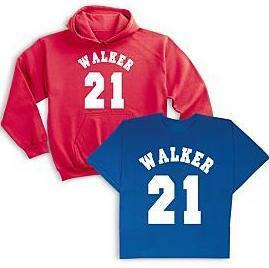 I recently ordered two personalized hooded sweatshirts for my two children for Christmas. These Personal Creations exclusives make the children in your life #1. You can personalize them with any name (up to 12 characters) and any number. I chose to personalize them with our last name and the year they were born. Let me say that our personalized hoodies will be turning heads! The colors are vivid and bold, and they are super soft (cotton/poly blend fleece)! My kids are going to want to wear them everyday... and they are going to be perfect for photos! I can hardly wait to have a photo shoot with them in their matching but unique hoodies on Christmas! I was highly impressed with the quality of my items and how quickly they arrived. Often times it seems to take forever for personalized items to arrive, but that wasn't the case with Personalized Creations! They put their customers first and it shows! Will you be giving any personalized gifts this holiday season?